For the past month, the Russian government, with Vladimir Putin its spotlight propagandist, has repeatedly declared that brutal anti-Russian ethnic violence as a prelude to ethnic-based civil war is imminent in Eastern Ukraine. That's a lie. What Eastern Ukraine really faces is a Russian military invasion -- and more on that in a moment. Kremlin claims of anti-Russian ethnic violence in Eastern Ukraine reprise the false accusations Putin made in February to provide media camouflage for the Russian seizure of the Crimean peninsula. Given the dire life-or-death threat, the Kremlin had to take all necessary military and humanitarian actions required to protect vulnerable ethnic Russians living in Crimea from violent attacks by Ukrainian fascists and ethnic fanatics and yada, yada, yada. On March 5, the U.S. State Department belatedly issued a fact sheet challenging that Kremlin crock. 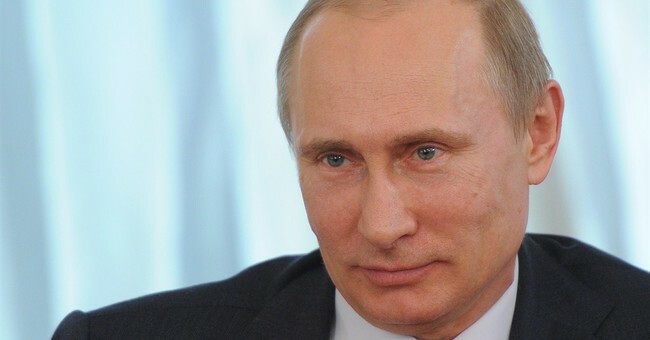 Titled "Putin's Fictions," the fact sheet discredited Putin's Crimean cover story. Ukrainian nationalists presented no threat to ethnic Russians. On the contrary, "strong evidence suggests that members of Russian security services are at the heart of the highly organized anti-Ukraine forces in Crimea." Putin's claims that Ukrainian fascists had launched "mass attacks on churches and synagogues" were a ludicrous and vicious fabrication. The March 18 annexation of Crimea, however, was dedicated to the glory of Russia, not humanitarian intervention. "We will do much more," Putin told an adoring crowd in Red Square. When it comes to vicious fabrications, to paraphrase Gertrude Stein, in the Kremlin, a Vladimir is a Vladimir. Vladimir Lenin, the Soviet Union's primal premier, said, "A lie told often enough becomes the truth." Lenin's Marxist advice prefigures Nazi propaganda minister Joseph Goebbels dictum to "Tell the big lie and repeat it." Whether Red or Brown (shirt), a totalitarian thug is a thug. Polemical repetition to grind down resistance to a lie is one tactic. If, like the Communists and Nazis, you control the state-run media, you can grind away for a very long time. However, Red and Brown thugs of the 1930s supported their lies with violent agitation and, ultimately, aggressive war. In September 1939, as the panzers rolled toward Warsaw, Nazis claimed Poland attacked Germany. In November 1939, Soviet dictator Joseph Stalin accused Finland of posing a threat to the USSR, so he demanded territorial concessions and then attacked the little country. In 2014, Putin's operatives in Crimea orchestrated incidents to "prove" his fiction. In Eastern Ukraine, agitation incidents by Russian operative serve similar propaganda purposes. A State Department fact sheet dated April 13 charged Russian military intelligence officers with coordinating provocations by pro-Russian militants. When viewed in light of potential Russian military operations, the outline of a well-conceived, integrated military plan emerges. The incidents in Eastern Ukraine smack of calculated battlefield preparation operations. These agitation incidents help the Kremlin gauge Ukrainian capabilities and will to resist. They are also creating operational options for Russian forces, should Putin give the signal to invade. The incidents in and around Slaviansk provide an example. Russian provocateurs seized government offices inside the city and an airfield to the south. However, Slaviansk is on a highway roughly midway between the cities Donetsk and Kharkiv -- truly key political objectives. Seizing Slaviansk gives Russian forces the option of wheeling north and isolating Kharkiv or turning south to Donetsk. At Slaviansk, Russian forces could drive west toward the Dnieper River and Kiev. Ukraine understands that Slaviansk is critical terrain. No wonder Slaviansk is where Ukraine has begun its "staged counter-offensive." Russia, however, could use Ukrainian counterattacks as a pretext for invasion. Here is how that works: On April 15, Ukrainian special operations troops re-captured the airfield south of Slaviansk, which had been seized by an alleged pro-Russian militia. Now think about that for a second -- threatened ethnic Russian citizens, fearing attack by Ukrainian gunmen, leave their neighborhood and go take a strategically useful airfield? Putin -- does he have brass -- claimed several ethnic Russians were slain in the attack; he called for U.N. condemnation of Ukraine. In response, Ukraine asked the U.N. to deploy peacekeepers to protect its territory.